Laura Neale was one of the first Heroes in training, a winner of the Good Guys Comic Book contest and a victim of a hit and run drunk driver. Her back was horribly broken and the doctors did not know if she would ever walk again. Her sister Sarah’s elbow was crushed in the accident. As a further challenge to the family, their home was only 5 miles from the epicenter of the Northridge earthquake. Cindy and Ted Neale were very traumatized by all the catastrophe’s hitting their family in a such a short period of time. As Ted, Cindy, Laura and Sarah tell about their traumatic experiences, you begin to realize: the inherent value of each family member, the importance of the love of a mom and dad and the Heroic Potential of each person. Why Every Community Can Benefit From a Local “In Search Of Heroes Program. Everyone benefits when these questions are answered by students, teachers and parents. One of the primary goals of the program is for students to realize their parents, family members, teachers, neighbors, friends, coaches, spiritual and community service leaders are the real Heroes. These individuals are the unsung HEROES of our world. They are HEROES who (H)elp (E)nthusiastically, (R)esponsibly, (O)ptimistically (E)xceptionally (S)ocially and/or (S)piritually. When young people understand professional athletes, musicians and movie stars may not be the best role models, they benefit from recognizing the real HEROES closer to home. Entrepreneurs, in particular, who hire and train students how to be successful business people, really help students make the world a better place for themselves, families and the community. Students have open minds, genius potential and free time. 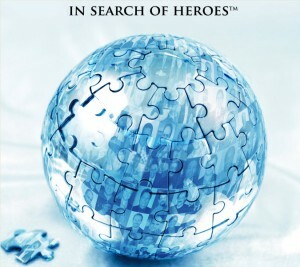 The In Search Of Heroes Program promotes good news by focusing on positive and uplifting ideas, actions and activities. Good news, a positive attitude, Heroic Role Models and adequate preparedness counter the harmful effects of FEAR. Many people are afraid because of wars, threats of war, terrorism, killer plagues, famine, starvation, poverty, financial catastrophe and violence that threaten every community. 1.Different mind-mapping software programs that transform information into a format that is easy for everyone to understand. Colorful mind-maps use words, colors, symbols and pictures to provide a brain-integrated overview. 2. Slide show creation software that uses words, pictures, movies, charts and animation to provide more detail in a form that appeals to whole brain processing. 3. Word processor software that creates outlines that are detailed and very specific with information that appeals to the linear, word-focused left brain. 4. Spreadsheet software that helps keep track of the entire program in their community. 5. Calendar software that helps everyone be on the same page by scheduling events and interviews. 6. Google+, Youtube and Hangouts that allows them to upload, edit and store and promote Heroes interviews and events internationally. 7. Google Gmail that provides email services and Google Drive storage for sharing documents, slideshows, spreadsheets, websites and more. 8. Google Apps for Educational institutions and non-profits that provide industrial strength IT security for a minimal fee. 9. Hootsuite that provides the automated dissemination of their online work to three social media sites for FREE. The In Search Of Heroes Program generates income to fund the program, activities, equipment, software, training and travel through viral marketing and existing affiliate programs of major companies. The understanding of true heroism and identification of those deserving of recognition as Heroes are critical for the survival of humanity. When HEROES “Rise up and inspire others!” all members of society have the models they need to become better people and problem solvers. Visit https://insearchofheroes.com for more information on becoming a family Hero.